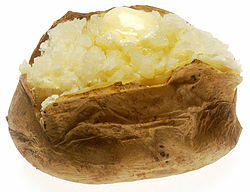 A baked potato, or jacket potato, is a potato that has been baked for eating. When well cooked, a baked potato has a fluffy interior and a crisp skin. It may be served with fillings and condiments such as butter, cheese, sour cream, gravy or even ground meat. Potatoes can be baked in a conventional gas or electric oven, a convection oven, a microwave oven, on a barbecue grill, or on/in an open fire. Some restaurants use special ovens designed specifically to cook large numbers of potatoes, then keep them warm and ready for service. Once a potato has been baked, some people discard the skin and eat only the softer and moister interior, while others enjoy the taste and texture of the crisp skin, which is rich in dietary fiber. Potatoes baked in their skins may lose between 20 and 40% of their vitamin C content because heating in air is slow and vitamin inactivation can continue for a long time. Small potatoes bake more quickly than large ones and therefore retain more of their vitamin C. Despite the popular misconception that potatoes are fattening, baked potatoes can be used as part of a healthy diet. Some people bake their potatoes and then scoop out the interior, leaving the skin as a shell. The white interior flesh can then be mixed with various other food items such as cheese, butter, or bacon bits. This mixture is then spooned back into the skin shells and they are replaced in the oven to warm through. In America these are known variously as loaded potato skins, filled potatoes and twice baked potatoes. In Great Britain, toppings or fillings tend to be more varied than they are in America: baked beans, curried chicken, tuna, and prawn fillings are popular, and in Scotland even haggis is used as a filling for jacket potatoes. A variation is Hasselback potatoes, where the potato is cut into very thin slices almost down the bottom, so that the potato still holds together, and is then baked in the oven, occasionally scalloped with cheese. The proper noun "Hasselback" refers to the luxurious Hasselbacken hotel and restaurant in Stockholm which originated this dish. Many restaurants serve baked potatoes with sides such as butter, sour cream, chives, shredded cheese, and bacon bits. These potatoes can be a side item to a steak dinner, or some similar entree. Sides are usually optional and customers can order as many or as few as they wish. Large, stuffed baked potatoes may be served as an entree, usually filled with meat in addition to any of the ingredients mentioned above. Barbecued or smoked meat or chili is substituted. Vegetables such as broccoli may also be added. Idaho is the major producing state of potatoes. The Idaho baked potato was heavily promoted by the Northern Pacific Railroad in the early 20th century, often using Hollywood movie stars. Hazen Titus was appointed as the Northern Pacific Railway's dining car superintendent in 1908. He talked to Yakima Valley farmers who complained that they were unable to sell their potato crops because their potatoes were simply too large. They fed them to hogs. Titus learned that a single potato could weigh from two to five pounds, but that smaller potatoes were preferred by the end buyers of the vegetable and that many considered them not to be edible because their thick, rough skin made them difficult to cook. Titus and his staff discovered the "inedible" potatoes were delicious after baking in a slow oven. He contracted to purchase as many potatoes as the farmers could produce that were more than two pounds in weight. Soon after the first delivery of "Netted Gem Bakers", they were offered to diners on the North Coast Limited beginning in 1909. Word of the line's specialty offering traveled quickly, and before long it was using "the Great Big Baked Potato" as a slogan to promote the railroad's passenger service. When an addition was built for the Northern Pacific's Seattle commissary in 1914, reporter wrote, "A large trade mark, in the shape of a baked potato, 40 ft.long and 18 ft. in diameter, surmounts the roof. The potato is electric lighted and its eyes, through the electric mechanism, are made to wink constantly. A cube of butter thrust into its split top glows intermittently." Premiums such as postcards, letter openers, and spoons were also produced to promote "The Route of the Great Big Baked Potato"; the slogan served the Northern Pacific for about 50 years. The song "Great Big Baked Potato" (words by N.R. Streeter and H. Caldwell; Music by Oliver George) was written about this potato. Hollywood star Lillian Russell shows off the Northern Pacific Railway's potatoes in this promotional postcard. A comic postcard circa 1910 to 1920 promoting "The Great Big Baked Potato". A baked potato is sometimes called a jacket potato in the United Kingdom. The baked potato has been popular in the UK for many years. In the mid-19th century, jacket potatoes were sold on the streets by hawkers during the autumn and winter months. In London, it was estimated that some 10 tons of baked potatoes were sold each day by this method. Common jacket potato fillings (or "toppings") in the United Kingdom include cheese and beans, tuna mayonnaise, chili con carne and chicken and bacon. Baked potatoes are often eaten on Guy Fawkes Night; traditionally they were often baked in the glowing embers of a bonfire. As part of the upsurge for more healthy fast food, the baked potato has again taken to the streets of the UK both in mobile units and restaurants. The fast-food chain Spudulike specialises in baked potatoes. A baked potato is called "pomme de terre au four" in French. It may be served as an accompaniment to a meat dish, or, in a fast-food restaurant called a "pataterie", be the centre of a meal. A regional variation of the baked potato is known in rural Armenian villages surrounding Lake Sevan as "p'ur" (Armenian: փուռ). Dried cow dung is stacked and used as fuel to slowly bake unseasoned potatoes which are placed in the center. Kumpir, a baked potato with various fillings, is a popular fast food in Turkey. In its basic form, it is made with potatoes that are wrapped with foil and baked in special ovens. The potatoes are cut straight down the middle[clarification needed] and the insides are mixed with unsalted butter and puréed with kaşar cheese. However, all sorts of foods can be added to the potato: mayonnaise, ketchup, pickles, sweetcorn, sausage slices, carrots, mushrooms and Russian salad. The cafés in Ortaköy, Istanbul make kumpir that are especially popular with the tourists and offer even more ingredients. Although baked potato with various fillings is not considered a traditional Russian dish, it has recently been gaining popularity as a fast food. The baked potato is reasonably popular in Brazil, where it is sometimes known as batata inglesa (literally translated as "English potato," likely due to the use of the English variety of potato, the 'King Edward'). 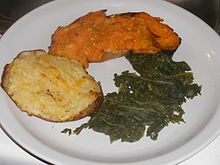 Wikimedia Commons has media related to Baked potatoes. ^ "jacket(5)". Chambers 21st Century Dictionary. ^ "Potatoes for schools". Archived from the original on 2005-10-27. Retrieved 2007-12-19. ^ Thomas, Briony (2007). Manual of Dietetic Practice (4th ed.). Wiley-Blackwell. p. 183. ISBN 1-4051-3525-5. ^ Thompson, Michael. "Baked Potato Bar". KLTV.com. Retrieved 25 July 2012. ^ James Lang (2001). Notes of a Potato Watcher. International Potato Center. pp. 44–46. ^ William Hathaway (2009). Idaho Falls Post Register. Arcadia Publishing. p. 53. ^ a b Mckenzie, William A., ed. (2004). Dining Car To The Pacific: The "Famously Good" Food of the Northern Pacific Railway. University of Minnesota Press. p. 176. ISBN 0816645620. ^ Porterfield, James D. (1998). Dining By Rail: The History and Recipes of America's Golden Age of Railroad Cuisine. Publisher: St. Martin's Griffin. p. 257. ISBN 0-312-18711-4. ^ "Great Big Baked Potato - music and lyrics". Archived from the original on 2006-09-14. Retrieved 2007-12-19. ^ Mayhew, Henry; Neuburg, Victor E. (1861). London labour and the London poor. Penguin Classics (reprinted 1985). pp. 174–176. ISBN 0-14-043241-8. ^ Mason, Laura (2004). Food Culture in Great Britain. Greenwood Press. p. 187. ISBN 0-313-32798-X. ^ "Masal Cafe". Archived from the original on 2007-12-01. Retrieved 2007-12-19. ^ "Turkish culture : cheese". Retrieved 2007-12-19. This page was last edited on 8 February 2019, at 08:48 (UTC).